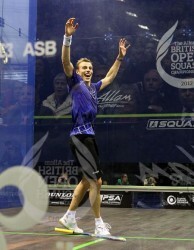 Nick Matthew overcame fiery Egyptian Ramy Ashour in straight games in today’s final of the Allam British Open to secure his place in history as the first Englishman to win the world’s most famous squash title for a third time. 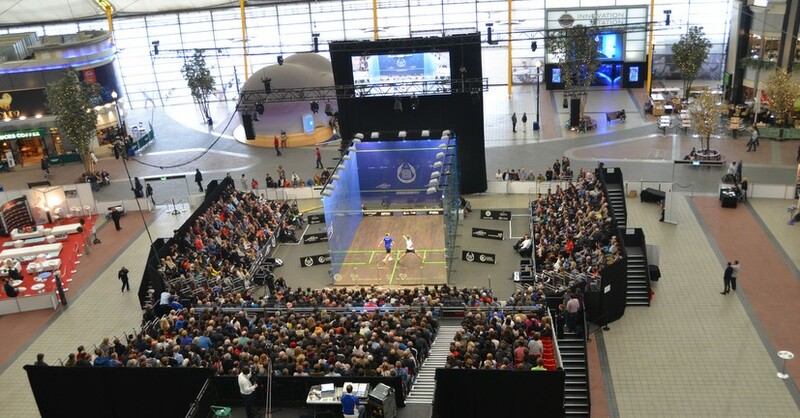 The 31-year-old from Sheffield produced a high level of accuracy throughout the match to win 11-9, 11-4, 11-8 in 49 minutes in front of a near capacity audience watching the PSA World Series event at the O2 Arena in London. 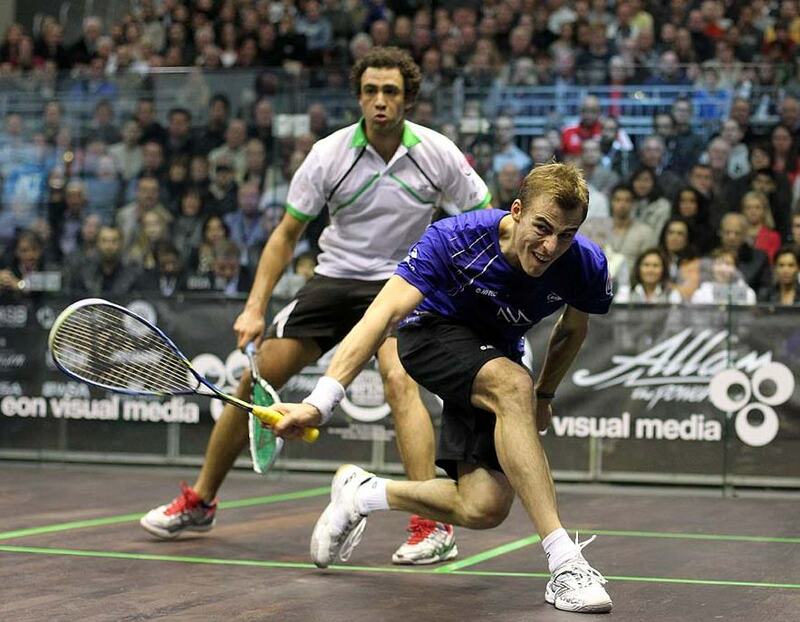 Ashour hit the tin 14 times during the match as Matthew’s precision squash forced him into mistakes. The 24-year-old from Cairo surrendered an 8-6 lead in the first game and was totally outplayed in the second as Matthew dominated the middle of the court and worked his opponent from corner to corner with tight drives, drops and volleys. The Yorkshireman continued to dominate in the third game and led 6-2 before Ashour responded with his best spell of the match to draw level at 8-8. However, Matthew regained control and more loose play from Ashour gave him the next three points. As Matthew moved to match ball, Ashour demanded a video replay but the world champion reminded the referee that the Egyptian had already used his appeal earlier in the game. 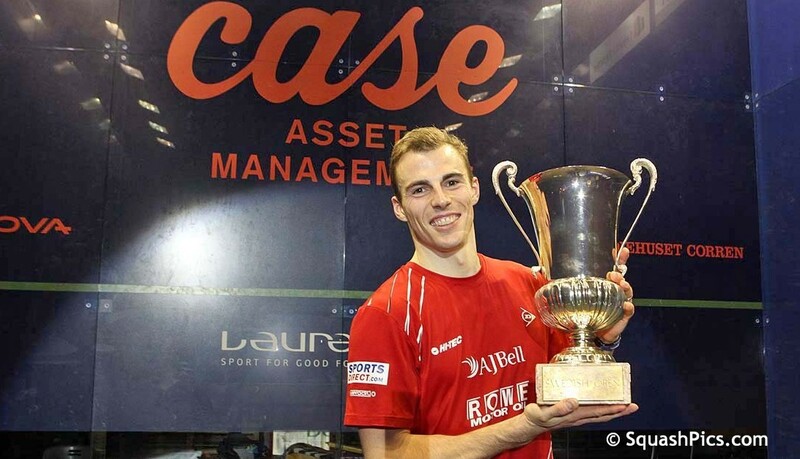 After collecting his trophy, Matthew thanked the title sponsor Dr Assem Allam for resurrecting the most celebrated tournament in squash, founded in 1930. “It’s great to have the British Open back on the calendar again and we owe a huge debt of gratitude to Dr Allam for making it happen,” said Matthew, previous winner of the title in 2006 and 2009. “I am 32 in July and may not have too many more finals left, but Ramy has many more to come. “He is a genius and a magician with the racket but he made a lot of errors today. There is a fine margin with those shots and had they been a few millimetres higher they would have been winners. 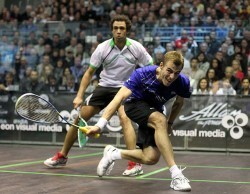 Ashour said: “Nick was really in the zone and was several steps ahead of me today in every department. I can’t be too downhearted because I have played well this week and am proud of what I did. “There is a thin margin between success and failure at the top level and a lot of shots did not work for me today. “I have been struggling a lot with injuries in the past year but I love this game and I consider squash one of God’s gifts. “In the third game I did not want to give up and tried to get a grip on myself. The British Open is one of the most important titles in the world and although it was a painful lesson today you need to learn from your defeats. 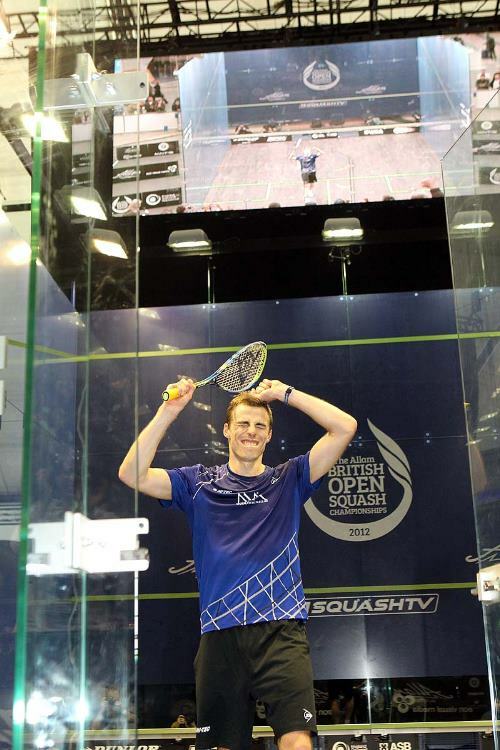 Matthew’s historic triumph strengthens his hold on second place in the PSA world rankings behind fellow YorkshiremanJames Willstrop, who succumbed to Ashour’s rampant racket skills in the best match of the tournament in the semi-finals. 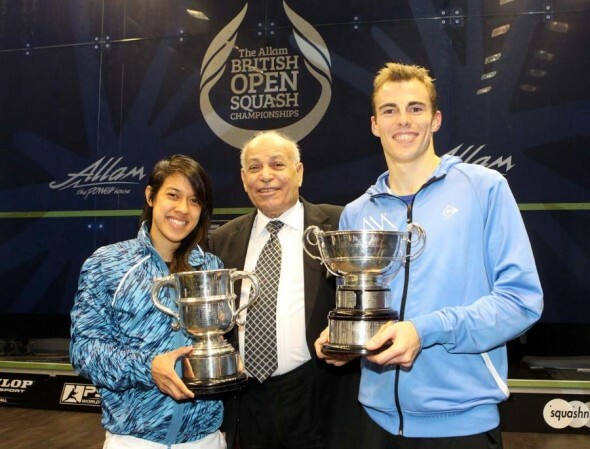 Nicol David regained her title in the Allam British Open Squash Championships after beating Nour El Sherbini. The Malaysian star took just three games to dispatch the giant-killing teenager, but conceded afterwards that she’d better get practising in order to stay at the top of the women’s game. It was a nervy start for Sherbini but the sixteen-year-old settled in quickly, catching up with the early run of points made by David. Despite the daunting occasion, her shot play selection remained ambitious, as it had been all week, but the weight of the spectacle may have resulted in the Egyptian looking to end the points quickly rather than work the rallies. This resulted in a few errors, which David was happy to take, along with her steady rallies and deadly efficient front court attacks to take the first game. Sherbini seemed more relaxed in the second. For a spell her lengths were tighter and her excellent short volleys were working well. She kept within three-points of her opponent until the midway stages of second, but her length began to fall slightly short and posed less of a threat as a result. A sustained period of pressure from David at the end forced loose balls which were picked off easily by the Malaysian. The teenager continued her search for a threatening length that wouldn’t quite come. As David continued to impose, the Egyptian seemed less and less confident to attack, favouring the lob over her previously excellent drops. The world No1 was ever threatening, boasting short to force pressure and picking off any returns. Understandably, in her 22nd game of the competition, Sherbini’s movement began to look sluggish as the match wore on, and her speed to the front slowed. Inevitably it was the World Champion who closed out the third game to claim title number 61, her fourth British Open title and draw level with Rachael Grinham in the list of all-time title holders. 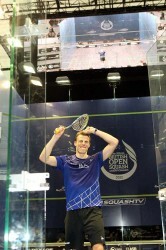 Great news and well played to both Nick & Nicol. Please do all that you can can as the governing body to get these wonderful results as much media coverage as possible. NOW is the time and THIS is the opportunity. News paper headlines, UK TV coverage, breakfast TV, a joint appearance on “A Question of Sport”. Please raise the profile, not only in the UK but around the sports world. I am sure that Nicol doesn’t have to work hard to raise her profile in Malaysia, she is already a major sports personality in her own country. Please help Nick, James and the others get their profiles raised here.